In the summer of 1962, Andy Warhol unveiled 32 Soup Cans in his first solo exhibition at the Ferus Gallery in Los Angeles—and sent the art world reeling. The responses ran from incredulity to outrage; the poet Taylor Mead described the exhibition as “a brilliant slap in the face to America.” The exhibition put Warhol on the map—and transformed American culture forever. Almost single-handedly, Warhol collapsed the centuries-old distinction between “high” and “low” culture, and created a new and radically modern aesthetic. 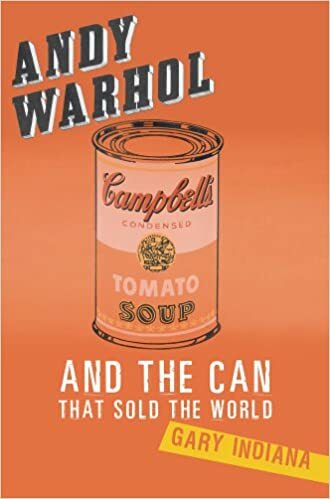 In Andy Warhol and the Can that Sold the World, the dazzlingly versatile critic Gary Indiana tells the story of the genesis and impact of this iconic work of art. With energy, wit, and tremendous perspicacity, Indiana recovers the exhilaration and controversy of the Pop Art Revolution and the brilliant, tormented, and profoundly narcissistic figure at its vanguard. way to play up the other extreme.7 This brittle, distancing attitude dominated the studio atmosphere as well; all that mattered was the steady production of work, regardless of whatever cacophony (loud music, blaring television sets, the amphetamine-fueled antics of people hanging around and rushing in and out) ruled the day. At his studios—his second homes—Warhol was the presiding spirit, the unquestioned boss. He seldom said anything. Others knew, almost telepathically, how he wanted things.